Super silent, Super powerful, remote operated. Decorative lighting with silent operations. Ever since pioneering the Peak Speed Performance Output (PSPO) technique, we have been the first adopters of new fan technologies in India. The Aero Series is our latest series which focusses not only on functionality but aesthetics and convenience as well. 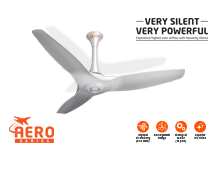 The silent ceiling fan - Aeroquiet gives high Air Throw output and is the first in its league with more brilliant designs to follow. The very silent, very powerful ceiling fan comes with aerodynamic blades, strongest motor and an eye-pleasing PU finish, making it the best product in its category and price range.